What do Australia, Canada, China, Denmark, India, Indonesia, Norway, Russia, South Korea, Sweden, Switzerland, Turkey, and the Eurozone have in common? 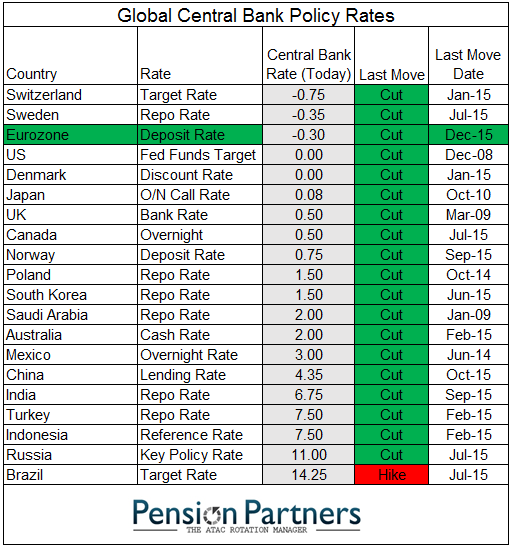 Their central banks have all cut interest rates in 2015. The ECB was the latest to join the easy money party in moving their deposit rate further into negative territory last week. Meanwhile, here in the U.S., the Federal Reserve is expected to move in the other direction on December 16, raising interest rates for the first time since 2006. The odds of a rate hike have moved all the way up to 80%. In recent weeks, the short-term Treasury market has started to price in a hike. U.S. 1-year Treasury yields are at their highest levels since 2008. 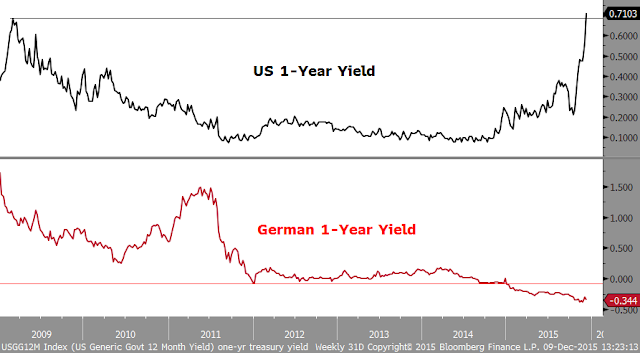 At the same time, German bunds of the same duration are hovering just above all-time lows. Oh, and by the way, German yields are negative. This great divergence in monetary policy and interest rates has been the dominant factor in currency markets since June 2014. 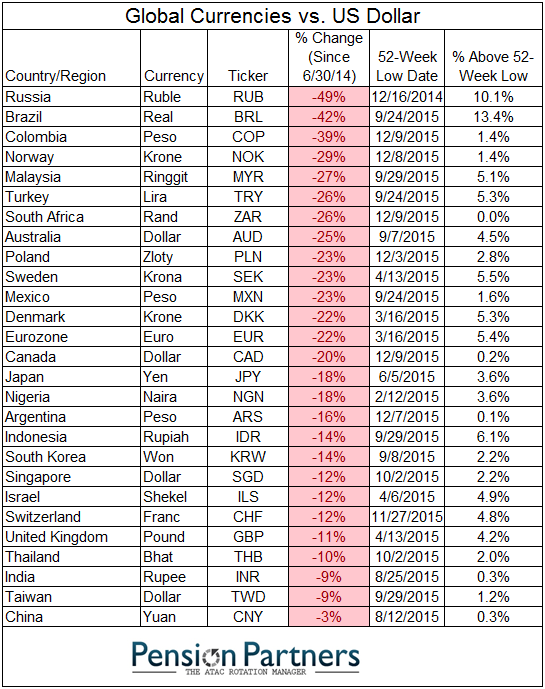 Every major global currency has depreciated versus the U.S. dollar with the Euro down more than 20%. The historic advance in King Dollar has been a headwind all year for the U.S. economy (particularly manufacturing) as well corporate revenues and earnings. As a result, many have argued that the Fed should refrain from raising rates to ensure the Dollar does not appreciate further against its easy money peers. 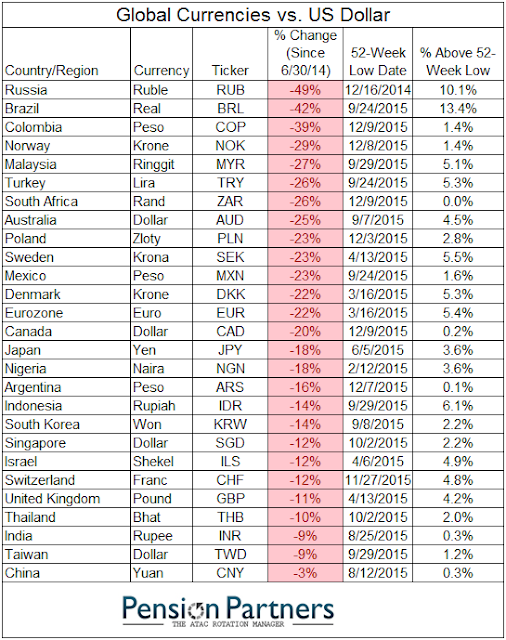 In a world of slowing growth, currency debasement has become the economic weapon of choice for central banks. This myopic view assumes there are no negative intended consequences to keeping rates at artificially low levels for years on end. It also assumes that you can debase your way to prosperity, which is the model that Japan and now Europe seem to be pursuing. In the real world, there are real costs to easy money. Starting to normalize interest rates after seven years is a healthy development in my view that actually will promote long-term growth. The Fed seems to have come to this realization as well and as such they will likely ignore the great divergence (for now) in hiking rates next week. 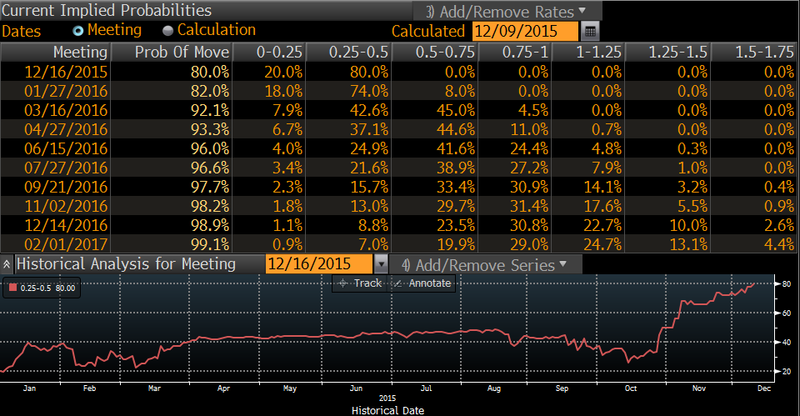 As for King Dollar in 2016, no one knows how much is already “priced in” and how much is path dependent. The broad consensus today is that the Fed will start a rate hiking cycle in December and that the ECB will hold rates at negative levels for at least another three years. Any deviation from this consensus with the Fed tightening less than anticipated or ECB turning more hawkish would change the course of the currency markets. What would be the biggest surprise to markets in 2016? A stalling or even depreciating Dollar.